« Follow the Rules, Dammit! Each Vermont summer has a personality, a character that you remember it by. Last summer it was the cool dampness, the summer before that, the violent thunderstorms. The summer of 2010 is the summer of sunsets. They’ve been bright, weird, otherworldly, spectacular and wonderful. 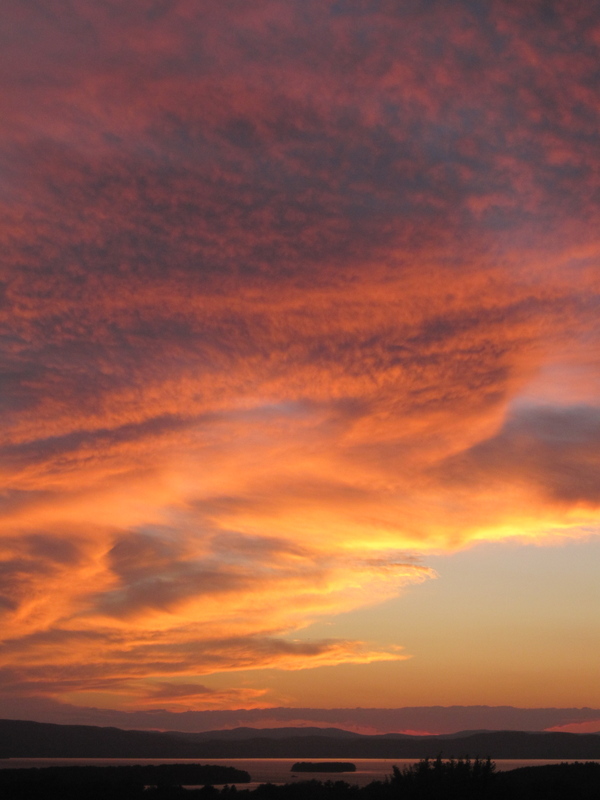 Maybe there’s something in the upper atmosphere, volcanic ash or something, that’s doing this to the sunsets. Tonight’s was the most unusual of them all this summer. I watched it from a windy hillside park in South Burlington, Vermont. 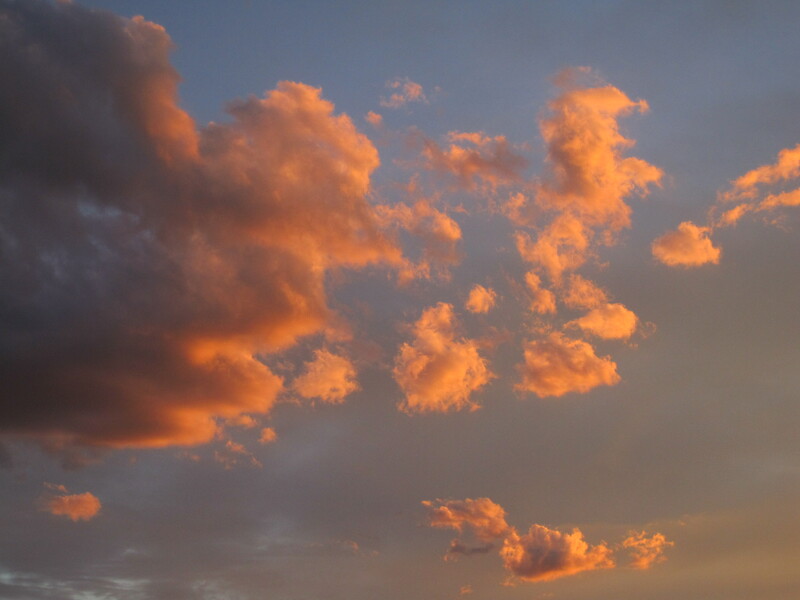 To me, the orange clouds were like symbols from a strange intergalactic language. Early in the show, people were fixated on the orange setting sun. I watched other clouds, overhead. A gray, high overcast formed a backdrop to lower, brightly lit clouds that looked like vague spaceships, or written letters of some intergalactic language. People left the park after the sun slipped below the horizon, but I knew that Act II of the show was coming up. The colors turned into a beautiful chaos, dominating the sky over a dark, calm Champlain Valley. The textured clouds were so overwhelming they seemed to threaten the ground below. 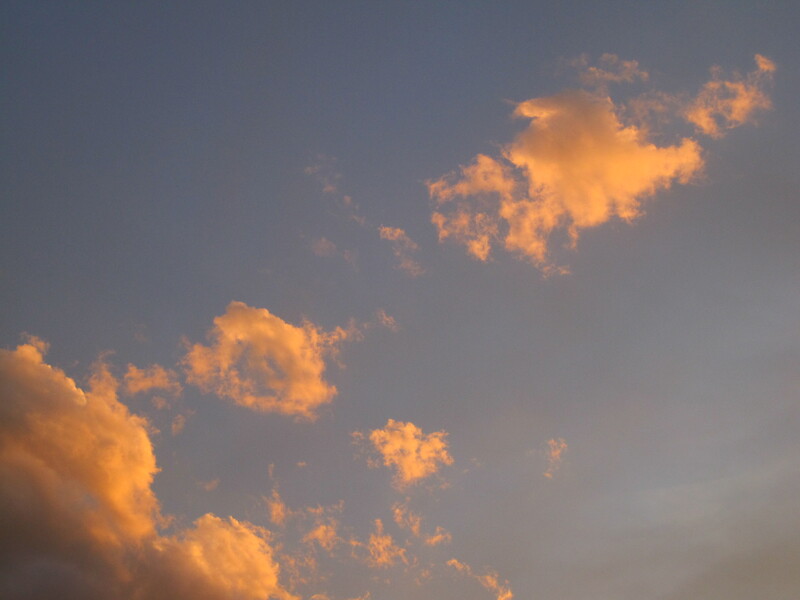 The low, orange clouds faded to gray, and what had been the gray, high clouds lit up. Finally, the sunset faded, and I headed north on Interstate 89, toward my St. Albans home. I was surprised by one last light show. I could see a large, isolated thunderstorm far to the north in the gathering darkness. Lightning flashed inside the storm, giving it an occasional, glow, as if it was alive. 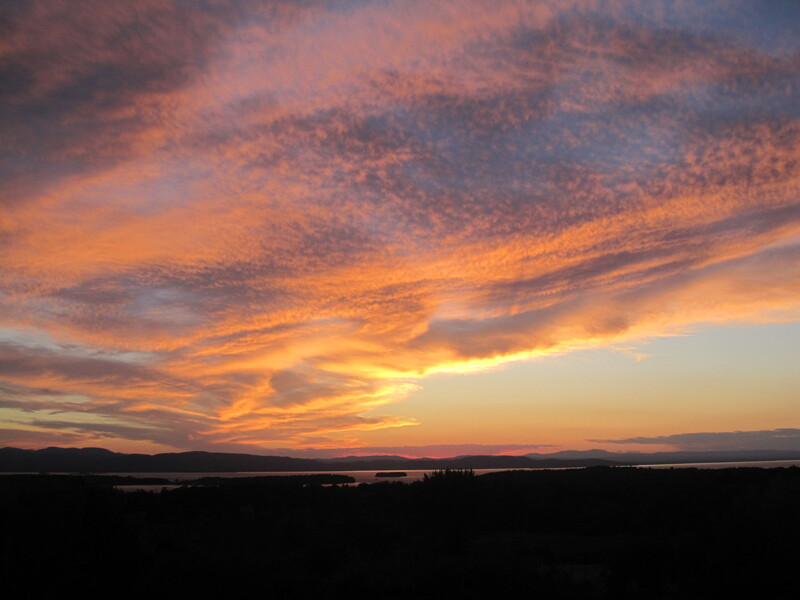 Tuesday evening's chaotic, spectacular sky loomed over a dark, calm Champlain Valley. I was surprised by how far away the storm was. I looked it up on radar, and it was well northeast of Montreal, or about 90 miles from St. Albans. Was tonight the last hurrah of a beautiful summer, or the crescendo of many more great sunsets, warm days and sunshine to come. I’m optimistic. After all, red sky at night, sailer’s delight. More great weather must be on the way. This entry was posted on August 18, 2010 at 1:35 am and is filed under Uncategorized. You can follow any responses to this entry through the RSS 2.0 feed. You can leave a response, or trackback from your own site.